Ann Curry is "still really processing" the fact that Matt Lauer has been fired from NBC. That's what the former "Today" co-anchor told People Wednesday after news broke that Lauer had been dismissed for alleged "inappropriate sexual behavior." Curry was famously fired from "Today" in 2012, only a year after she was promoted from news anchor to the couch with Lauer. These days she is helming a new PBS docuseries "We'll Meet Again" which reunites people who have suffered trauma with those who helped them. The new series is set begin airing in early 2018. And while she declined to comment directly on Lauer's termination, Curry did tell the publication that "the women's movement got us into the workplace, but it didn't make us safe once we got there." "And the battle lines are now clear," she said. "We need to move this revolution forward and make our workplaces safe. Corporate America is quite clearly failing to do so, and unless it does something to change that, we need to keep doing more ourselves." For Curry's fans, Wednesday was a day of redemption. There has been a long held belief that Lauer was behind Curry's ouster, a theory that was bolstered by CNN's Brian Stelter's 2013 book "Top of the Morning: Inside the Cutthroat World of Morning TV." The book detailed "Operation Bambi," an effort within NBC to force Curry off the show. Lauer was said to dislike working with Curry, and made that known while he was negotiating his new contract. Curry's tearful last show touched many viewers. On Wednesday, some fans took to social media to both remember the messiness of her departure and theorize that she was enjoying Lauer's very public fall from grace. 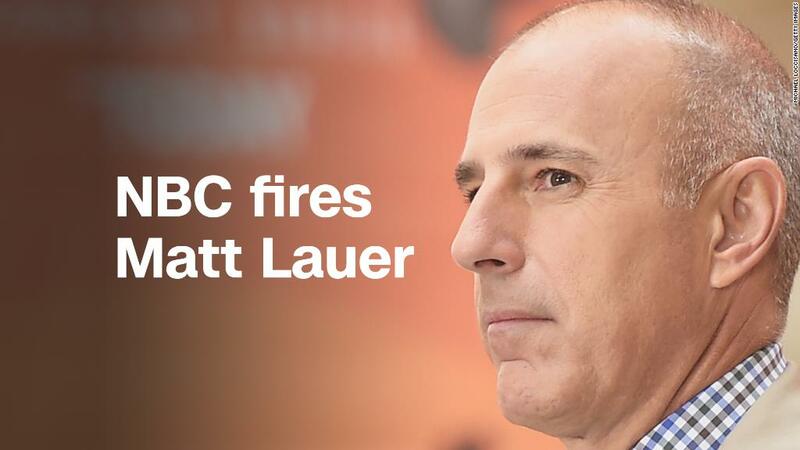 They should make Matt Lauer give a "tearful, emotional" goodbye on live television like they did to Ann Curry. Fans also mentioned former "Today' co-host Tamron Hall who left the show earlier this year after it was announced new hire Megyn Kelly would be taking over her time slot. And of course there were the inevitable calls to bring either Curry or Hall or both back to "Today." As of Wednesday afternoon, Hall had not commented on Lauer.